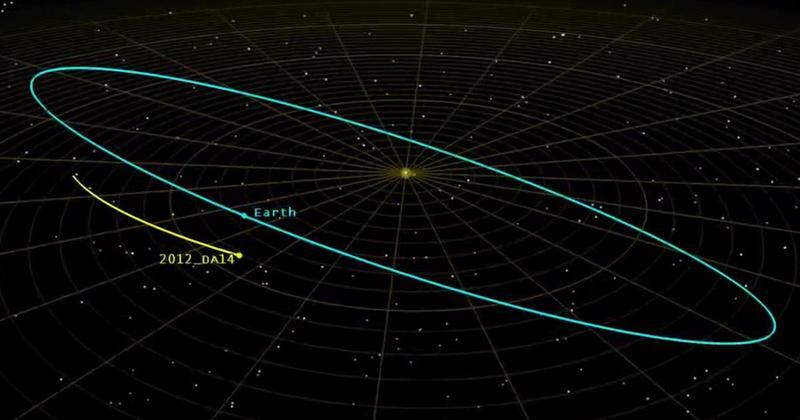 Asteroid 2012 DA14 will fly so close to Earth's gravitational pull that scientists say the space rock could experience violent tremors. The asteroid, which is said to be about half the size of a football field, is expected to pass us by on Friday, and possibly even disrupt telecommunications because of its proximity to Earth—it'll flyby about 17,200 miles from where you and I sit right now, which actually isn't that far in space talk. According to Richard Binzel, a professor of planetary science at MIT, this is the first opportunity we've had to observe such an event on an object so close to Earth. The phenomenon is referred to as "space weathering," which typically causes asteroids to "shed a worn-looking outer coating," Space.com wrote. "Gravitational forces during the flybys can stretch, rattle and torque these asteroids, causing dark, space-weathered material on the surface to be overturned, revealing the fresh stuff underneath," Binzel said. "These asteroids experience [seismic activity in the milli- to micro-g range." Basically, an asteroid quake is nothing like what you'd experience here on Earth. Still, Binzel says a little shaking goes "a long way" in space. The flyby is expected to occur tomorrow afternoon, so we'll see what Binzel and his team learn.